Walking pictures were taken in most corners of the British Isles. From the coastal town of Rothesay on the Isle Of Bute in Scotland, down to Margate on the South Coast; from Dublin, through Wales and across to the East coast towns of Bridlington and Skegness. From Blackpool in the North West across to Whitby and Scarborough. Away from the seaside holiday towns and resorts, walking pictures were also taken in many of the big industrial cities, although the trade was more intermittent and short lived here – except for London. There are also difficulties in identifying urban walkies, as many carry no company information, but we have seen examples from Sheffield (see photo above), Leeds, Bradford, Bath, Derby and more. A full list of firms and towns will appear in the Go Home On A Postcard book published in 2018. The trade wasn’t confined to the UK either. 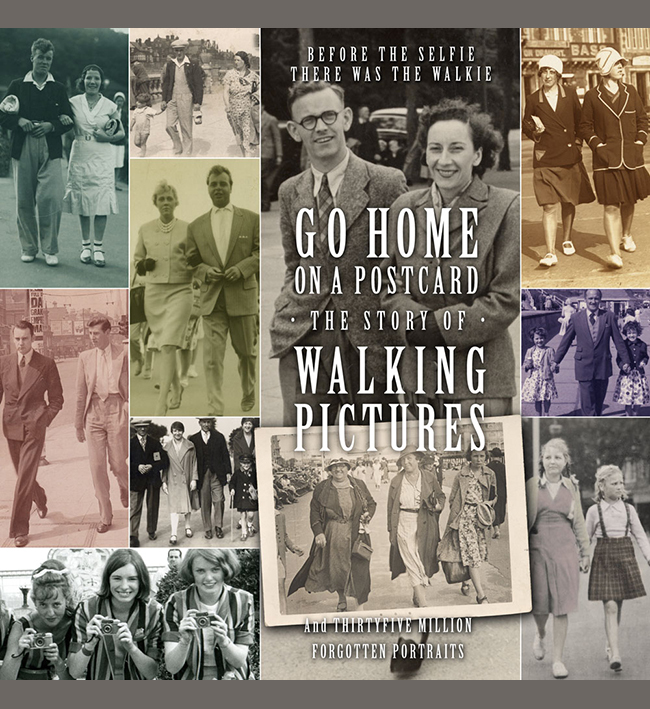 Walking pictures were hugely popular in America, and one archive in New York has a rescued collection of walkies from one company which is estimated to contain over 2 million images. I have seen walkies from Australia (again some reels of film survive with hundreds of images on), South Africa, Turkey, many European countries and South America. The trade continued in Iraq at least through the first Gulf War, and people on skiing holidays report that photography students offer a similar service today. 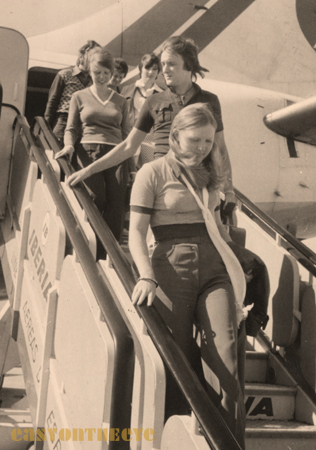 Cameramen lurked at the side of aeroplanes in the fifties to snap travellers disembarking (see photo above), and there appears to have been a photographer taking shots of passengers strolling round the Titanic. Many holiday camps operated their own service, while photographers snapped people walking around Cheddar Gorge. If street photographers have vanished from our towns, echoes of the trade continue with automated services operating on the London Eye and on rides at bigger fairgrounds. Visit the Mining Museum in Yorkshire, and a photographer is on hand to snap visitors emerging from the underground tour and offer them prints half an hour later.